A fierce controversy is raging in the Peruvian Amazon over the activities of a film crew working for the British TV company Cicada Films. Local Indians, government officials and independent scientists have accused the film-makers of visiting very isolated Indian communities, despite being warned not to. The isolated Indians reported later that the visit provoked an epidemic of respiratory disease that left four people dead and others seriously ill. The crew were apparently scouting locations for a reality TV show called ‘World’s Lost Tribes’, to be broadcast on Discovery Channel. Dr. Shepard says in his statement that the film-crew decided to travel further upriver to very isolated Indian villages, although he warned the crew that, due to the Indians’ isolation and their lack of resistance to common Western diseases, such a trip could seriously endanger their lives. According to a statement from the regional Indian organization FENAMAD, the crew did indeed travel deep upriver and provoked a flu epidemic, resulting in several deaths. FENAMAD accuse the film-makers of ‘threatening the lives of isolated Indians’, and have called for Cicada Films to be blocked from entering the area again. The head of the government’s Protected Areas department has written that the Cicada team ‘were given a permit to visit only the community of Yomybato; that the permit expressly prohibited visiting uncontacted or recently-contacted Indians… [but] the permit was not respected and the Cicada team entered [remote headwaters] which are part of the Strictly Protected Zone’. They have also said that the team will not be allowed into the area again. 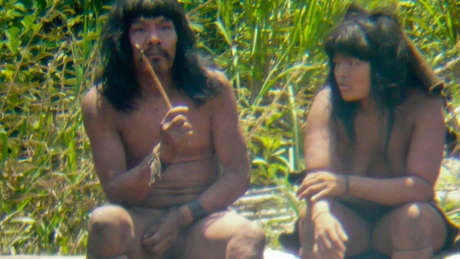 Cicada Films previously caused controversy with a documentary about an expedition to visit Indians in Ecuador, which allegedly provoked an attack from uncontacted Waorani Indians.